I love Discovery Day. Other schools call it Career Day, or the like, but at Regnart Elementary School in Cupertino, they call it Discovery Day. 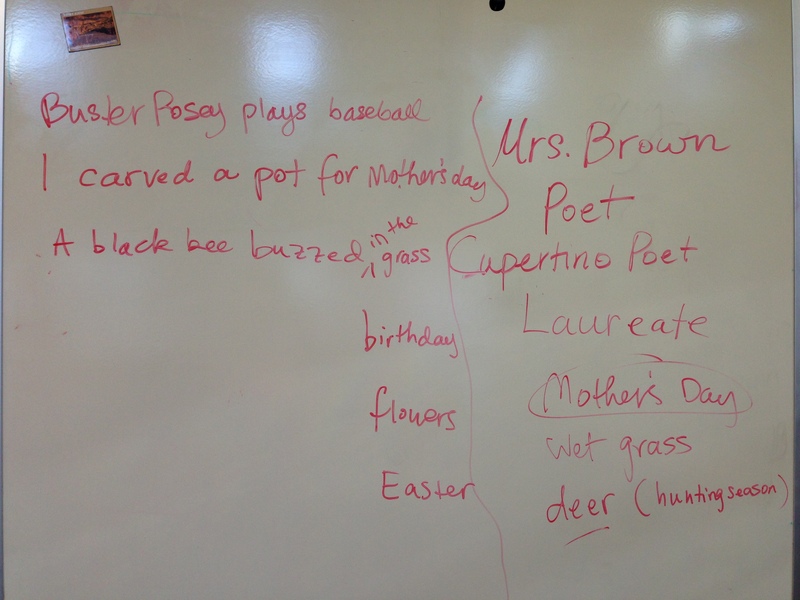 I first started talking to Regnart students about my life as a poet when my own kids were there. 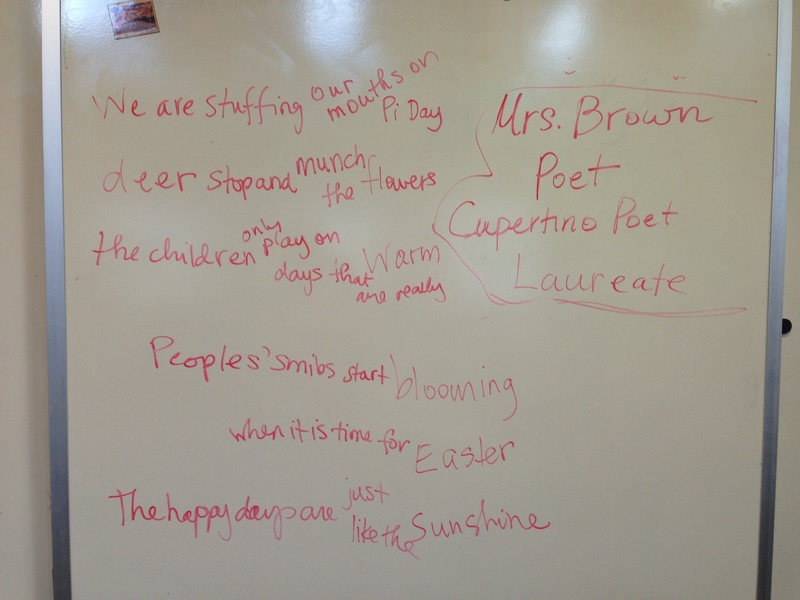 This past month, I had the special privilege of not only talking about being a poet and a poetry teacher, but of explaining what a poet laureate is. 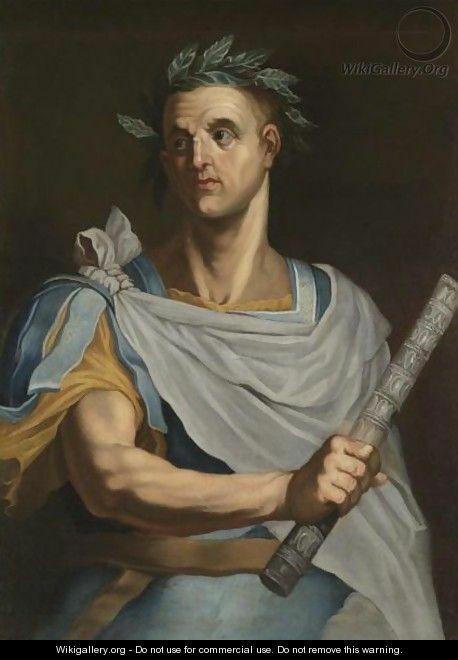 Fortunately, third and fourth graders usually have been introduced to images of Greeks and Romans in togas, with laurel wreathes on their heads. That helps them understand that a laureate is a person recognized for her wisdom or status in a particular field. 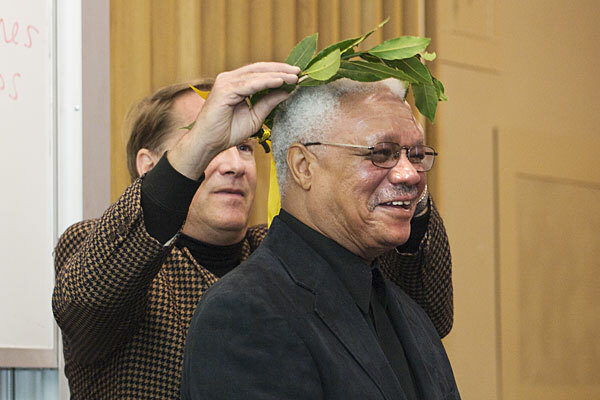 Former California Poet Laureate, Al Young, with his laurel wreath. 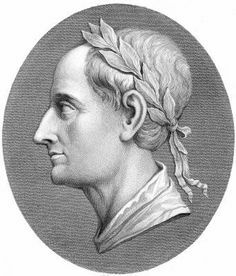 Of course, I explain, I’m not really not the most famous or wisest poet around, and the PL status I enjoy is only loaned to me by the city. But they understand that it’s my job to teach about poetry in Cupertino, and several of them remembered seeing me with my magnetic poetry at the Library Anniversary last October. 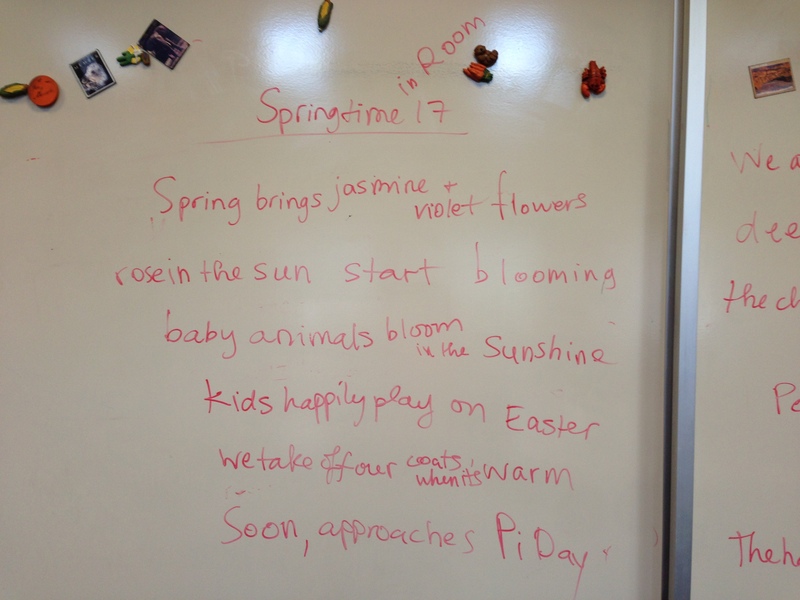 This year I had a great time, as always, and I talked to the kids about how the Chamber of Commerce had asked me to write a poem for the Lunar New Year. 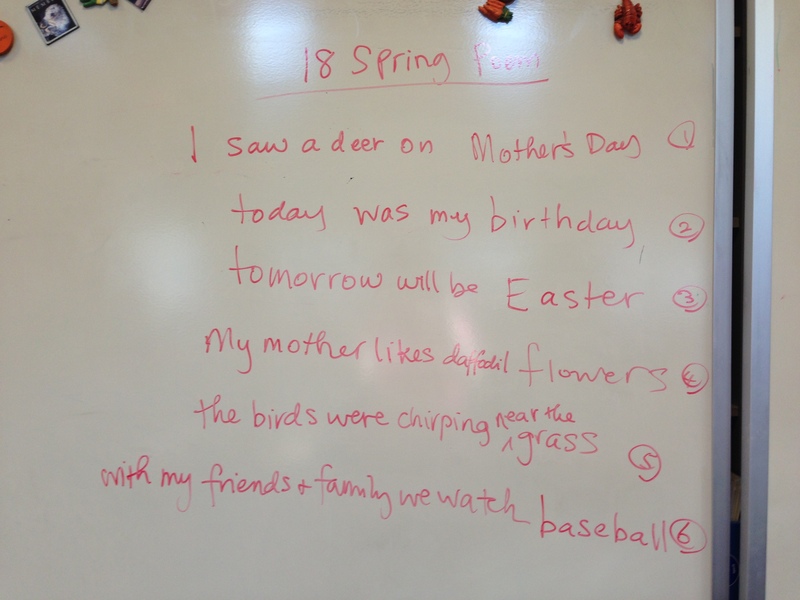 Many kids recalled that we just celebrated the Year of the Ram, Goat, or Sheep, and in each class there was a child who spoke the one word in Chinese that could be translated into any one of these animal words in English. I shared with them my Lunar New Year sestina. Then I explained that I wanted to write a sestina with them about spring. We discussed how many kids had celebrated Holi, how many celebrate Easter. The kids knew all about St. Patrick’s Day, President Lincoln’s birthday, and April Fools Day. Some remembered Pi Day. 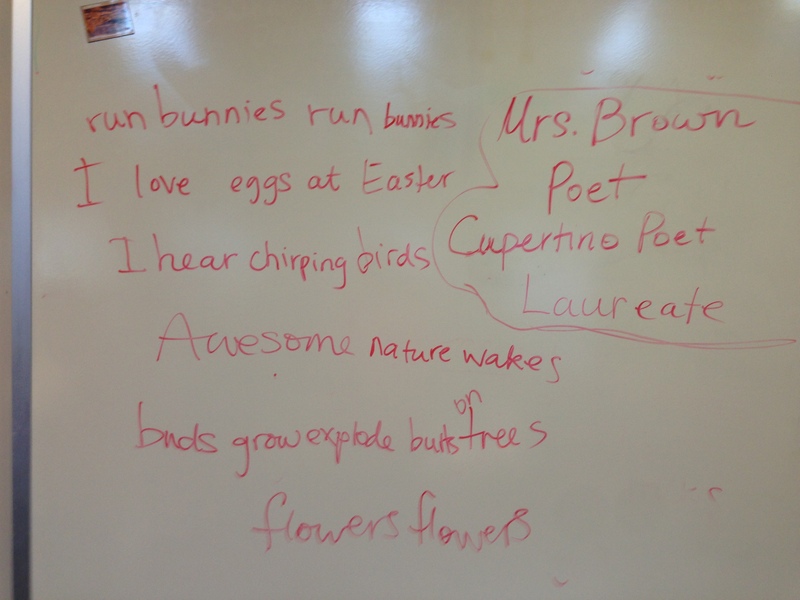 We talked about baby animals, the flowers and trees and the smells and the warm air. I pushed them to remember details from their own houses and gardens and not just “greeting card” images and ideas. 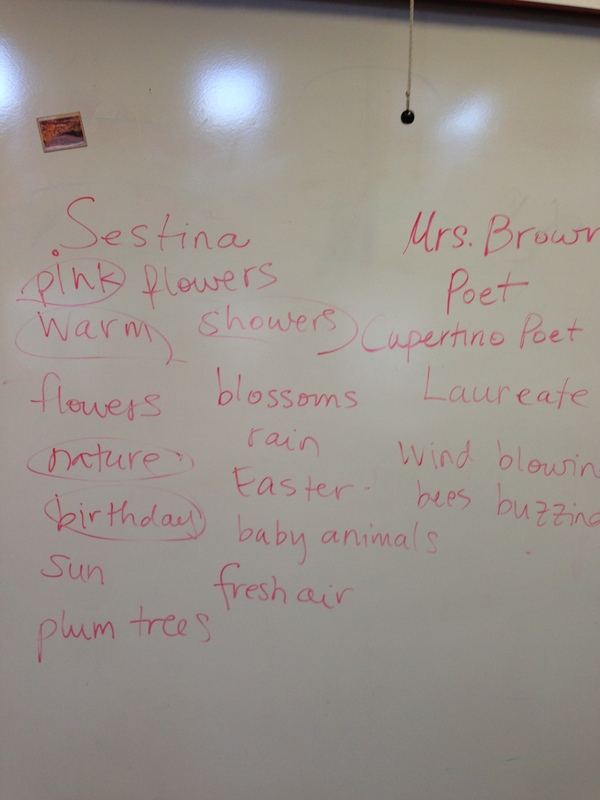 In each class we wrote at least one stanza of a sestina. 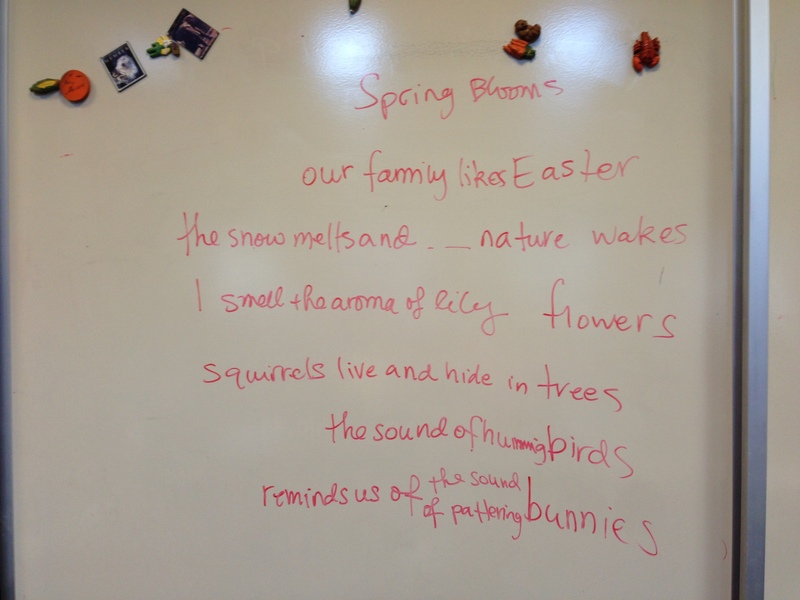 Here are some photos I took from the whiteboards. I hope to get some of these poems typed up and shared back with the students. 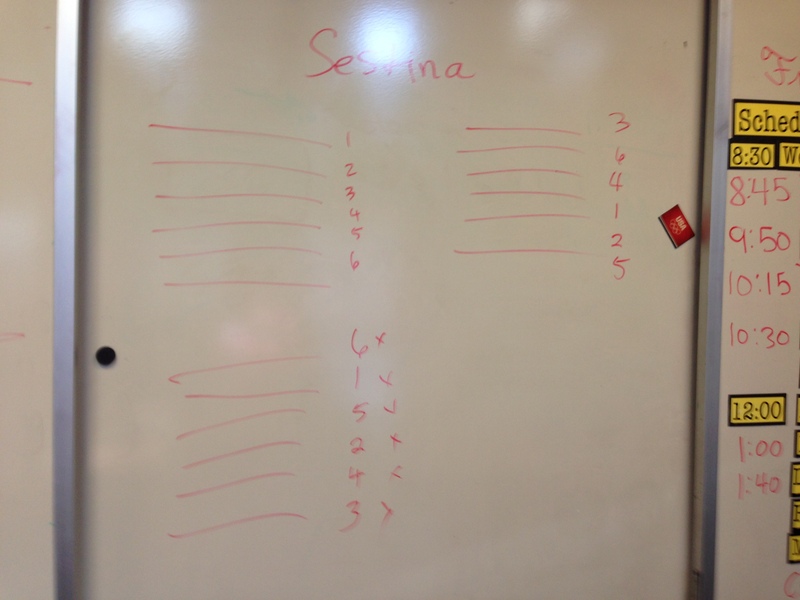 I think at least one teacher was going to encourage the students to write the rest of the long sestina poem. Wouldn’t that be grand? I hope they ask me again next year.